The heroic deeds of such individuals as Theseus, Perseus and Heracles, were important elements of the stories from Greek mythology. Also important were the gathering of heroes, and today the stories of Jason and the Argonauts, and the Trojan War, are some of the best known tales. There was though another gathering of heroes, a story famous in antiquity although largely forgotten today, a gathering that saw heroes take part in the Calydonian Hunt. The story of the hunt for the Calydonian Boar can be dated back to before the times of Homer and Hesiod, as both Greek writers were aware of the story, but no complete story of events exists from this time. Today, the stories relating to the Calydonian Boar come from a later period when the likes of Ovid (Metamorphoses) and Apollodorus (Bibliotheca) were writing. At the time when the story was set, Calydon was a city state in Aetolia ruled by King Oeneus. Oeneus had been blessed by the god Dionysus with bountiful vines, and so very year the first harvest from the vines was sacrificed to all of the gods. ​One year though the sacrifice went awry, and Oeneus forgot to offer up tribute to Artemis, the goddess of the hunt, who was greatly offended by missed sacrifice. To vent her rage, Artemis sent forth a gigantic boar into the Calydon countryside; Strabo would write that the boar was the offspring of the Crommyonian Sow, but no other writer in antiquity wrote of the boar’s origins. The Calydonian Boar, as it became known, terrorised the population of Calydon. Crops were destroyed, and people killed, and it was soon recognised that no-one in Calydon could stand up against the monstrous beast. King Oeneus dispatched heralds across the ancient world, calling for assistance from any hunters willing to risk life and limb to rid Calydon of the might boar. 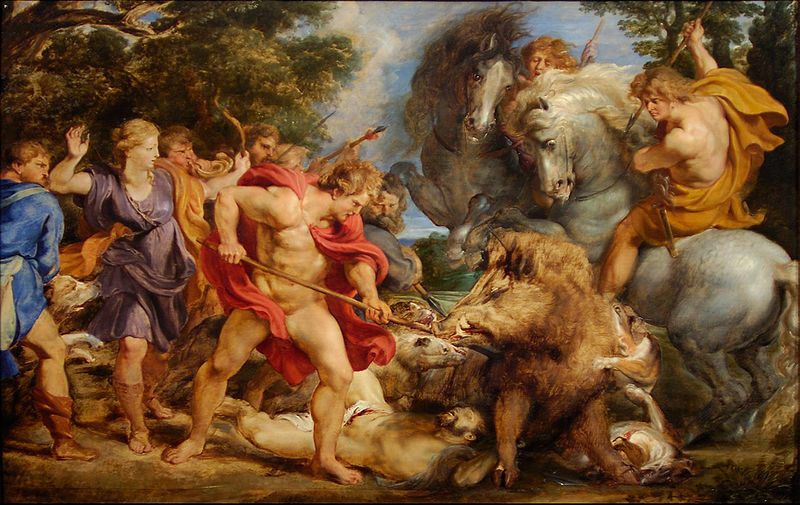 Oeneus promised that the skin and tusks of the monstrous boar would go to the hunter who managed to kill it. It was fortunate for Oeneus that the quest for the Golden Fleece had just finished, and so many of the Argonauts who were in Iolcus travelled from Thessaly to Aetolia. Many others though, also answered to call for assistance. There is no definitive list for who the hunters were, and differing lists can be obtained from Apollodorus’ Bibliotheca, Hyginus’ Fabulae, Pausanias’ Description of Greece and Ovid’s Metamorphoses. Meleager – Arguably the most important of the hunters was Meleager, the son of King Oineus. Meleager had been aboard the Argo and had returned to his father’s kingdom subsequently. Meleager would lead the rest of the hunters in the pursuit of the beast. Atalanta – Atalanta was the most famous female heroine to appear in stories from Greek mythology; raised by the huntress goddess Artemis, Atalanta was said to be match for any man in terms of ability. The presence of Atalanta on the hunt though would cause friction amongst the male hunters, and some ancient writers would claim this was the reason why Artemis arranged the presence of Atalanta in Calydon. Theseus – if Atalanta is one of the most famous heroines, then Theseus was one of the most famous heroes; and being renowned for killing the Minotaur, Crommyonian Sow and the Cretan Bull, Theseus took up his arms against the Calydonian Boar. Ancaeus – Although not as famous as the preceding three hunters, Ancaeus though was significant in his own right. 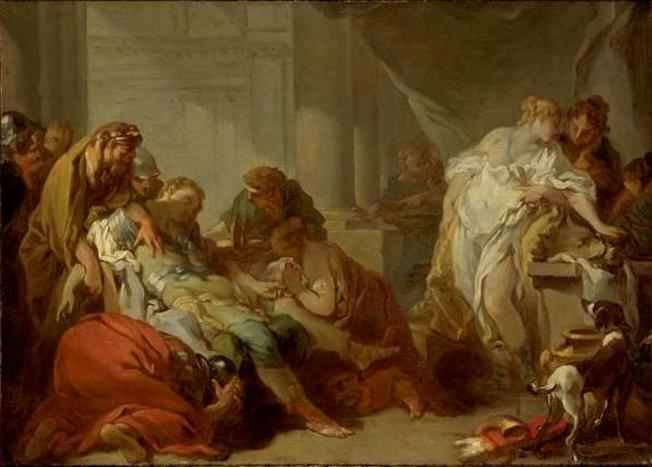 A prince of Arcadia, Ancaeus had been an Argonaut, but when he went after the boar, he was overconfident, and the Calydonian Boar would gore Ancaeus, killing him. Castor and Pollox – The twin sons of Leda, Castor and Pollox were collectively known as the Dioscuri, with one being mortal and the other immortal. The pair would appear in many notable stories from Greek mythology, and were both Argonauts and hunters of the Calydon Boar. Peleus – Another member of the crew of the Argo and hunter was Peleus, the father of Achilles. During the Calydonian Hunt though, Peleus was most noted for the killing of his father-in-law, and act that would later require absolution back in Iolcus. Telamon – Telamon was brother to Peleus, and father to Ajax the Great, like his brother he would take part in the quest for the Golden Fleece and the Calydonian Boar. There were many other notable heroes quoted by one or more of the ancient writers including; Pirithous, companion of Theseus, Laertes, the father of Odysseus, Iolaus, nephew and companion of Heracles, Prothous, an uncle of Meleager, and Jason, the captain of the Argo. The gathered band of heroes was as strong a grouping as had been gathered to go to Colchis for the Golden Fleece, but before the hunt could precede, Meleager had to first convince the other gather hunters that it was appropriate for Atalanta to be part of the hunt. Meleager himself had fallen in love with the beautiful huntress. Most of the other hunters required little convincing as the prowess of Atalanta was already well established, although Prothous and Cometes, uncles to Meleager, were vehemently opposed. Meleager would eventually lead out the band of hunters into the Calydon countryside. With the skills and prestige of the heroes assembled, the result of the hunt was never in doubt, and despite the loss of Ancaeus, the Calydonian boar was soon cornered. It was Atalanta who was said to have inflicted the first would on the Calydonian Boar, having hit the beast with an arrow unleashed from her bow; and with the strength of the beast waning, Meleager struck the killing bow. It might be assumed that the successful conclusion of the hunt would bring a close to the story of the Calydonian hunt, but as was the way with stories of Greek mythology, a happy ending was not forthcoming. The prize for killing the Calydonian Boar, was the hide and tusks of the beast, and so logically, the prize would go to Meleager. Meleager though decided the prize instead should go to Atalanta, after all it was the huntress who had inflicted the first wound. Meleager’s act might be seen as a gallant one, but it only riled Prothous and Cometes further. In the eyes of Meleager’s uncles, if Meleager did not wish to claim the prize, then they were the next in line to receive the prize. The lack of respect shown by his uncles, caused Meleager to become angry, and killed both Prothous and Cometes where they stood. Prothous and Cometes were brothers to Meleager’s mother, and her feelings for her brothers was apparently stronger than the feelings for her sons, as when she learned of their deaths, she burnt a magical piece of wood. Meleager had been protected from harm as long as that piece of wood was whole, but upon its destruction Meleager himself died. 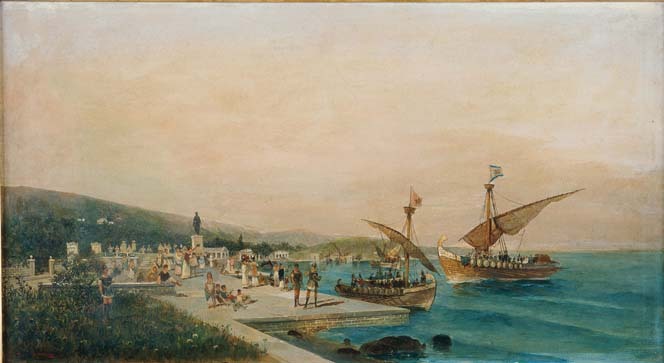 In some versions of the story, it was not simply that uncles and nephew died, but that the dispute over the prize, resulted in a full fledged war between the Calydonians and the Curetes, although in the war, Meleager, Prothous and Cometes also died. After the death of Meleager, Atalanta would take the prized skin and tusks of the boar, and would place them in a sacred grove in Arcadia, with the prize dedicated to the goddess Artemis. The hunt for the Calydonian Boar was a favourite one amongst Greek mythological tale, and in antiquity showed the power of the gods, and the need to worship them appropriately. The story also showed that the heroic could also overcome seemingly impossible tasks, and it was much better therefore to live a heroic life, rather than a mundane one.